Your students want fast, easy-to-access information. You want to give them thorough coverage of the very latest, most essential content. 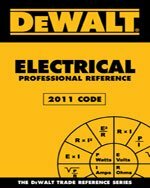 The DEWALT® Electrical Professional Reference 2011 Code gives you the best of both worlds – in a handy pocket-sized package! The book delves into areas critical for success in an electrical professional's career, from motors, transformers, and grounding, to voltage drops, fastener charts, and tools. With value that will extend far past the classroom, this reference guide is packed with valuable diagrams, practical examples, and everything your electrical students will need for future success. Check out our app, DEWALT® Mobile Pro™. This free app is a construction calculator with integrated reference materials and access to hundreds of additional calculations as add-ons. To learn more, visit dewalt.com/mobilepro.